Home Hill was the family home of Joseph and Dame Enid Lyons from its construction in 1916 through until Joe’s untimely death in 1939. Dame Enid continued to live at the property until her passing in 1981. 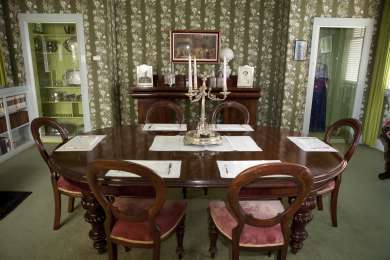 Since then the property has been a house museum and memorial to a remarkable Tasmanian family. 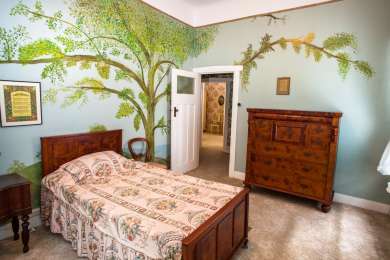 The property is located at 77 Middle Road in Devonport, Tasmania. The land that the home stands on was originally purchased by Joe Lyons in 1915, with an eye to providing some security if his fledgling political career were to come to a premature end. The plot consisted of nine acres of land in total, five acres of which were an established apple orchard, located 1.5 miles (2.4 kilometres) from the centre of Devonport. Joe and Enid were already engaged at the time of the land purchase, and Enid took on responsibility for selecting the design of the home and supervising construction. The new home would need to accommodate not just the newlywed couple, but also Joe’s father Michael and his three younger siblings. Eventually Enid chose a plan that had recently won a newspaper competition for 'best small house design’; a seven-room Federation-style weatherboard design. The house was founded on a bluestone base that was built with materials quarried from the property, and the total contract price was agreed at £425. Once construction was complete the family moved in during September of 1916, just six weeks before the birth of Joe and Enid’s first son Desmond. Home Hill remained a constant presence in the life of the Lyons family throughout the dramatic events that they would experience over the next twenty five years. As Joe’s political career began to blossom he began to spend more and more time away from home. The journey to Hobart by railway for State Parliament took ten hours each way, and Joe frequently had to stay in a train car overnight at the Western Junction rail yard. In 1920 Home Hill was sold to Carl and Eveline Jensen, and in 1923 the family made arrangements to relocate to Hobart. The period in Hobart was not a happy time for the Lyons family, with the passing of young Garnett Lyons at just 10 months of age and Joe being involved in a serious road accident that left him with permanent injuries. In 1928, it was discovered that the Jensen family were interested in moving to Hobart so a property swap was made and the Lyons family returned to Home Hill, at least temporarily. Joe’s election to Federal Parliament in 1929 began a new period of travel and dislocation for the Lyons family. 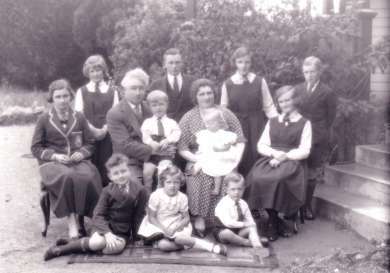 The entire family moved to a property in Dandenong Road, Melbourne for a period of ten months in 1930, and over the next nine years Joe, Enid and the children divided their time between Home Hill, Melbourne and Canberra. Throughout this tumultuous period, Home Hill continued to serve as a beacon of stability, representing the idea of something steady and reliable, and of family. Dame Enid recalled in her memoir And So We Take Comfort of one occasion of returning to Devonport and experiencing the familiar feeling of ‘coming home exhausted to the house on the hill… we called it Home Hill. It has been Home Hill ever since’. The house itself underwent significant changes over the years, as the size of the family grew and priorities changed. In 1935, major alterations were made that included larger kitchen and dining areas, and the addition of a dormitory and bedrooms in new ‘wings’ on either side. The last major changes in the 1950s were brought on by children ‘leaving the nest’ and the reduced need for bedroom space, allowing for a dedicated pantry, library and relaxation room. Dame Enid was remarkably hands-on when it came to designing, interior decorating and maintaining the gardens, and the property is notable for its exquisite furnishings and wallpapers. She redesigned the layout of Home Hill to create a long vista from the entrance hall through the sitting room, to the library and dining room beyond. On one occasion, when she found herself unhappy with the shade of wallpaper, ‘she painstakingly went over the whole room with watercolours, increasing the intensity of colour in each motif’. Her son Barry recalled that his mother would enthusiastically turn her hand to any task that required attention, telling him that ‘you only got the tradesmen in when you were electrocuted’. The changing political responsibilities of Joe Lyons also saw changes to the way that the spaces within the house were used. 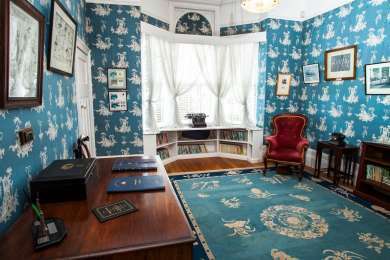 One of the more striking rooms in the property, dubbed the ‘Wedgewood Room’ after the design of the wallpaper, was repurposed as a dedicated office while Joe was serving as Premier and Prime Minister. It was here, on the 25th of March 1936, that Joe took the first interstate phone call to Tasmania via a new submarine cable across Bass Strait. A short wave radio facility was installed at Home Hill by the Jensen family, who used the service to operate an amateur radio station named 7LJ. Joe took to radio broadcasting with great gusto and found it an effective electioneering tool as it enabled him to reach a vast and captive audience while Prime Minister. Enid later used the same line to broadcast her own radio program from home, and between 1939 and 1940 she recorded a weekly 20 minute spot for the Macquarie Network. Dame Enid continued to live at Home Hill up until her death in 1981.To guarantee the home would be lovingly maintained and remain connected to the local community, Enid arranged a division of responsibilities between the Devonport City Council and the National Trust of Tasmania. The property and grounds were purchased by the City Council, which performs maintenance and upkeep, while the National Trust was made responsible for the contents of the home and the operations of the house museum. The property at Home Hill remains open to the public for guided tours and community events.